This blog will teach you to get moving and create your first neural network in 10 minutes. 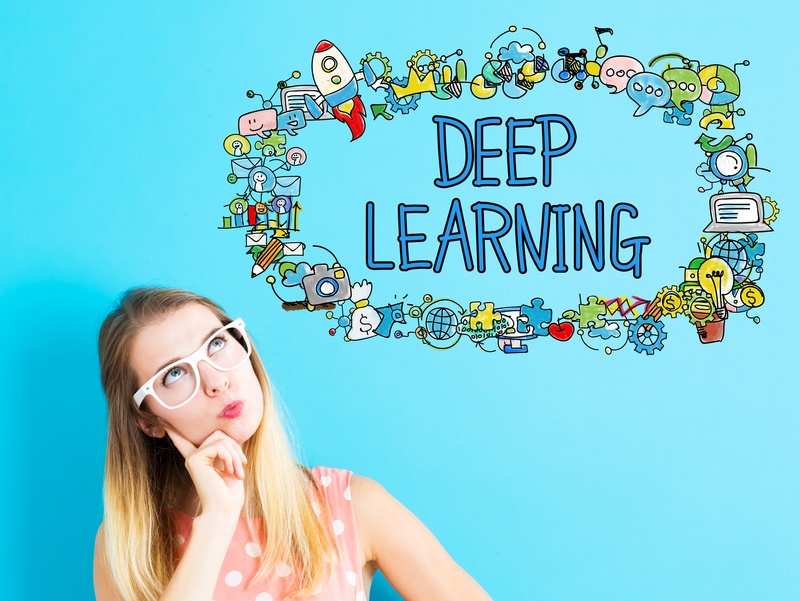 We will use the Google Open source deep learning platform called as TensorFlow for this. Our overall goal is to create a 3 layer neural network and get this to train on a dataset. We then use the trained model to check our predictions. We will use ‘TF’ as TensorFlow in the rest of the blog. First, let us test that all components of TensorFlow are working by doing a simple addition. We also turn off the logs at 2 but this is an optional step. The two input tensors are hard-coded just for testing purpose. We run this and we see the Addition result. So all looks good for setting up the Neural network. Our datasheet is a Sales data sheet whose values if you see closely are in Lower range of 0 and 1 only. This may cause problems with our ANN and hence we need to Scale input values for TF using a standard function from SciKit learn. For any ANN we can have 3 ways to input data in a model. They are – a) Using in memory (make sure your computer RAM size is >> Input file size), b) Use Data Pipes for very data sets as images and videos c) Use code to split step by step. We will use the simple method of using in memory using Pandas data frame. The input files are dummy here and assume the column headers A,B,C,D stands for some business needs and is confidential. In many real life cases while working client will probably not say what columns stand for. The predicted value would be the column total_earnings. We use the MinMaxScaler from the famous Scikit learn package. MinMaxScaler Transforms features by scaling each feature to a given range. It may multiply or add some random numbers to change values. 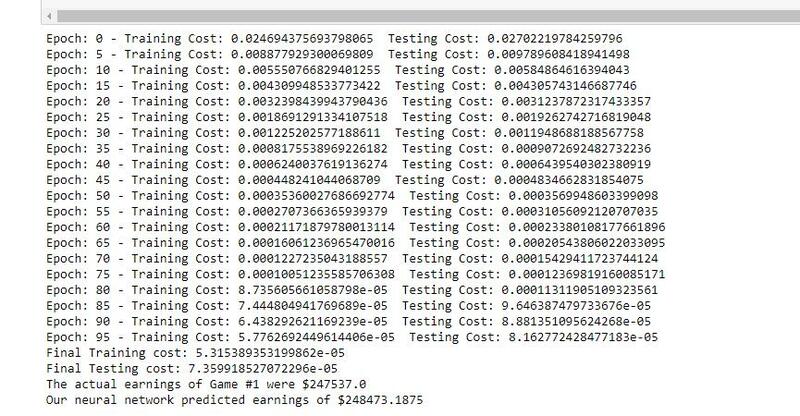 It is no brainer that we take the predicted column name (total_earnings) from the X train as drooping column. If this is new to you please check on train-test-split. Here we have done the spilt using separate input files for training and testing. We then Pull out columns for X (data to train with) and Y (value to predict). This is pretty much standard after that but be sure that the training and test data are scaled with the same scaler. Ok Go ahead and run now. You would see the Scaler working to get you scaled values. 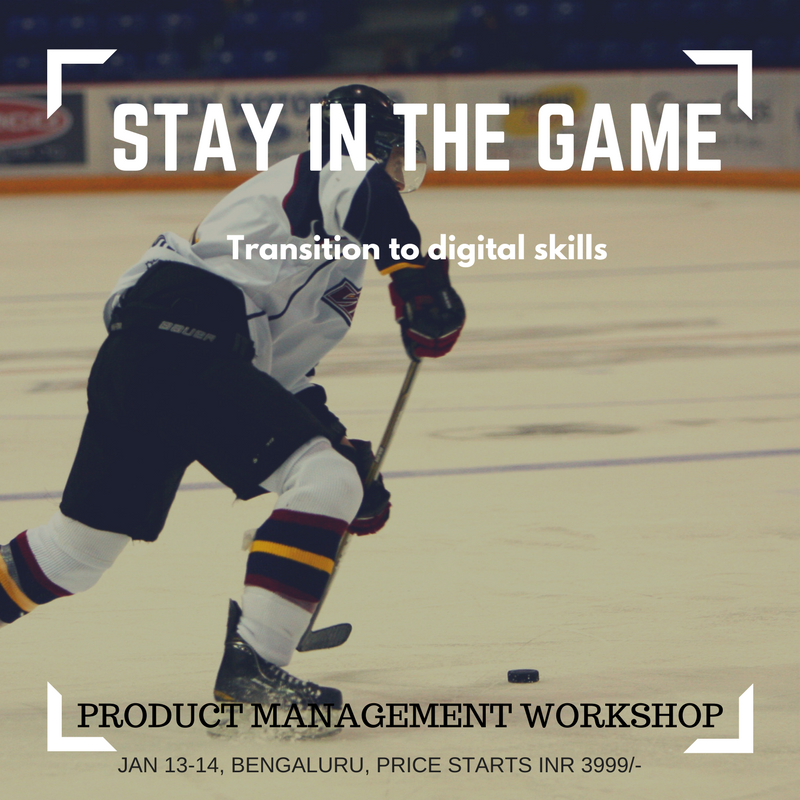 Now – we would need to train the model. We frame the Neural network as with below parameters for 100 epochs with 9 Inputs and 1 output which is the Predicted Price. Go ahead and run the code. You would see the model getting trained. Take a pause now and pat yourself. You are midway through. Well done! 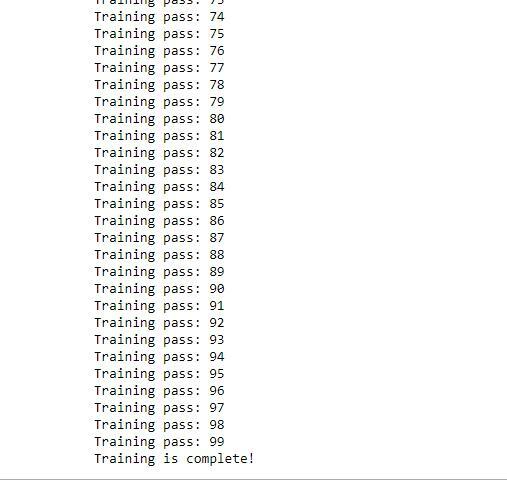 Your result should show the training getting completed in 100 epochs with interval of 5. In the final part we would need to test the trained model using cost function. Finally, call a TF session and check for every 5 training steps, log our progress. The Model will improve and cost function will reduce showing improvement in the ANN learning outcome. The final outcome I got from the prediction value is below and you would have a similar value depending on the configurations you did. Thank you for reading and keep learning.